I am new to the Crew and this is my first Malibu and have some questions about ballast upgrades for surfing. I have read a lot of good info on this subject, however my boat is a little different. The previous owner installed some custom surf gates, prob got the idea from someone on here. My current ballast set up is a stock MLS system, hard tanks in the rear lockers and center tank in the "ski locker". Starboard side: wedge down, starboard tank full, port empty, center tank full and gate out it throws a pretty good wake on the starboard side. Port side with wedge down, port tank full, starboard empty, center full and gate out the wake is lacking. 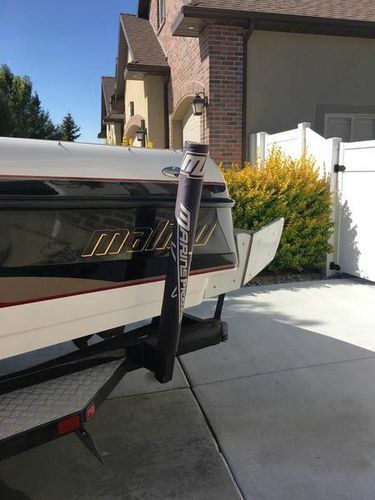 If removing the hard tanks is it best for me to go with the Wakemasters plug and play system that adds 820# into each rear locker for $580 bucks? I like this system since they say its plug and play and I can use my factory switches and what not. Or is it better to go with the 1100# setup and do a little more work to plumb it in? Any pics or suggested would be greatly appreciated. With gates added to the hull you will want to evenly weight the stern with maybe a slight bias to the surfing side. The Wakemakers kit is nice in the fact that it really is plug and play with all of the fittings needed. Only thing I did on my 04 was relocate the drain pumps as far back toward the transom instead of leaving them on the bow side of the sacs like OEM. Only had to splice wires to make them longer there was enough drain hose to make it work. I went with the 900# sacs when they had them available a couple years ago. Honestly, we never fill them all the way since gates require the hull to be more evenly weighted and it it will become too much weight if you can't compensate with bow ballast. The more weight you put in the stern the more weight you will want in the bow/midship as well. Aim for 40/60 split of weight bow/stern.